The new Cobra Commander decides that he wants a change of scenery. In the Bagan Province of Nanzhao, soldiers working for the country's Ministry of Resources threaten a group of gold miners with execution for stealing gold; but before they can decide how many they are to kill, the sound of approaching motors are heard, before gunfire from a flight of Mamba helicopters marked with Cobra's emblem kills the soldiers. The miners gaze up at the sky at their saviors... but their relief is short-lived, as on recieving further orders, the Mambas firebomb the site and kill everyone present. Recent events have been bad for G.I. Joe: hundreds dead, the Pit destroyed, the captured Dreadnaught sunk and the Bear Lake facility compromised. But more bad news is arising in the aftermath, as General Hawk's superiors have decided that the team is going to have to make do with less, with a much-reduced budget, the Joes must stay based out of Fort Baxter, and their equipment stores will be restricted to what they already have. Hawk is furious at the idea of having to take on Cobra out of a World War II-era camp, but the official in charge doesn't believe that Cobra even exists... until an aide enters the room with news of an emergent situation: Cobra has invaded Dvaravati, the capital city of Nanzhao, with all-out force! At Fort Baxter, Scarlett speaks to Snake Eyes, who is sitting in darkness. Though Cobra has revealed themselves to the world and attacked on a grand scale, Snake Eyes' Team Foxtrot is off the roster, as they're still in recovery from their last operation. But despite being given the option to sit the mission out, Snake Eyes — along with his teammates Agent Helix and Iceberg — arrive to take their place on the Joes' troop transporter. Flint attempts to protest their presence, not wanting to be part of one of the ninja's "off-the-books adventures"... but Snake Eyes silently walks past him and onto the plane, leaving Flint embarrassed and frustrated. As the Joes' plane takes off for Nanzhao, Scarlett outlines their tactical status to G.I. Joe command: as a totalitarian dictatorship with no friends or allies, Nanzhao is unlikely to find any support in the face of the Cobra invasion, and so it's likely that Cobra will have no resistance to its conquest. Cobra has already taken all key government facilities and is controlling the nation's roads with the help of the Karen rebels; in the face of such an overwhelming victory, the Joes have little choice but to wait and see what comes next. The rest of command makes their plans: Hawk has the team stage their evacuation of Americans from Nanzhao from Thailand, Mainframe examines Cobra's history to try and predict their next move, Shipwreck makes for the Andaman Sea to keep an eye on ocean-bound traffic, and Flint radios in confirming that teams Alpha, Bravo and Delta are on the way, as well as a stowaway element of team Foxtrot... which Scarlett reveals that she authorised, based on Snake Eyes' experience in the area. And, indeed, Snake Eyes was there some time before; during Operation Boarhound, the Joes' mission to Rangoon, where Snake Eyes went rogue from G.I. Joe to take on Cobra. In the Nanzhao province of Ching Mai, a minister in a luxury sports car is being escorted by army forces to the Malay border, but though he is promised that every eventuality has been anticipated, his guards are surprised when a ninja drops from the tree canopy above, killing the guards with grenades and destroying the minister and his vehicle with plastic explosives. The ninja has demonstrated to his Arashikage followers that they did not need his help... but to them, it was an honor to watch Stormshadow work. "How does a secret unit made up of personnel who officially do not exist operate out of a World War Two-era camp in the middle of Kansas?" —General Hawk wants answers, but it isn't the job of the government official to give them. ""To the world we will be seen as expedient, ruthless and determined. But we are also removing a brutal regime and destroying billions of dollars in heroin fields and stocks. The weaklings who create global policy and law will be confused. Conflicted. A toxic mix of doubt and fright will immobilize them. And Cobra will have seized control of a sovereign nation. All while driving up the value of Cobra's own illegal drug commodities." Nanzhao (aka Hyunnan) is hardly a subtle stand-in for Myanmar (aka Burma), and indeed is referred to several times in a way that makes it hard to imagine how it could be anything other than Myanmar renamed, but this issue has the least subtle version, as dialogue seems to suggest that Rangoon — aka Yangon, the largest city in Myanmar — is part of Nanzhao, and the flag of Myanmar is shown flying outside a Nanzhaoese government building. Evidence of a last-second name change for the country Cobra was invading, or just a necessary plot hole that IDW decided to roll with? The mission that Snake Eyes' team is recovering from is the one from the first arc of G.I. Joe: Snake Eyes. Snake Eyes' ill-fated mission to Rangoon was first mentioned waaaay back in G.I. Joe vol. 1 #6. Details were spotty, though it was always implied to involve a confrontation with Cobra, but here we get to see a flashback showing that Storm Shadow was involved. In several panels the reflection in Cobra Commander's visor is very obviously a smaller pattern stretched out over a space far too big for it, rendering it blocky and pixellated. This will carry over into subsequent issues drawn by Alex Cal. Iceberg is drawn without his trademark moustache and hat, making him look a lot more like his fellow Foxtrot member Alpine. Both sides of the minister's conversation with the general are shown to be coming from the minister, rendering the dialogue very confusing. 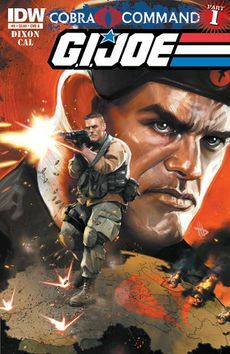 Cover A: Cobra leaves their mark on the world, Duke opens fire on an unseen foe, and Flint realises that he left the oven on, by Dave Wilkins. Cover B: Cobra Commander presides over the invasion of Nanzhao, by Wil Rosado and Romulo Fajardo, Jr.
Cover RI: Stalker laughs at Duke's misery, by Nick Runge. This page was last edited on 7 October 2017, at 22:33.